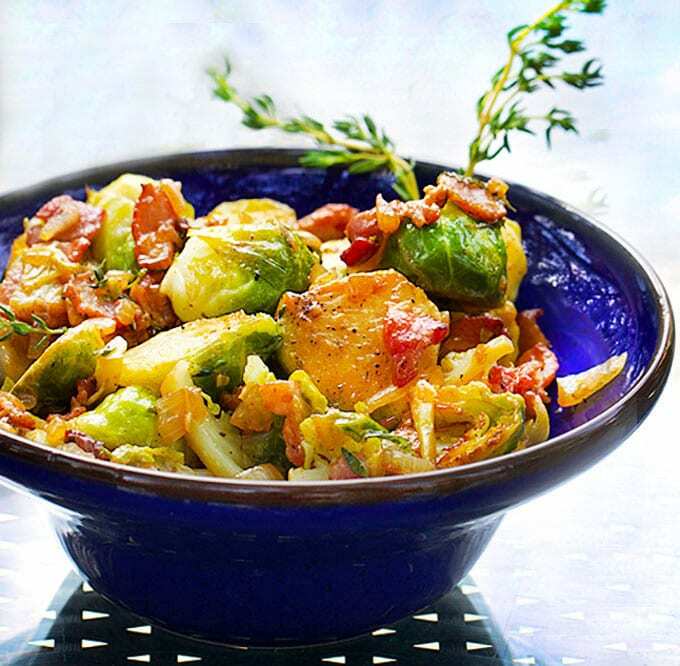 Caramelized skillet brussels sprouts with bacon, shallots & sherry vinaigrette. Veggie side dishes don’t get more delicious than this! is about the joy of cooking great all-American recipes using cast iron cookware. Here are some of the recipes I can’t wait to try: Oatmeal Buttermilk Pancakes, Chile Verde Pork Stew, The Crispiest Chicken Thighs Ever, Roast Pork Loin with Maple-Bourbon-Mustard sauce, and Rhubarb Millet Crisp. Many of the recipes in the book are contributed by well known chefs and food writers. 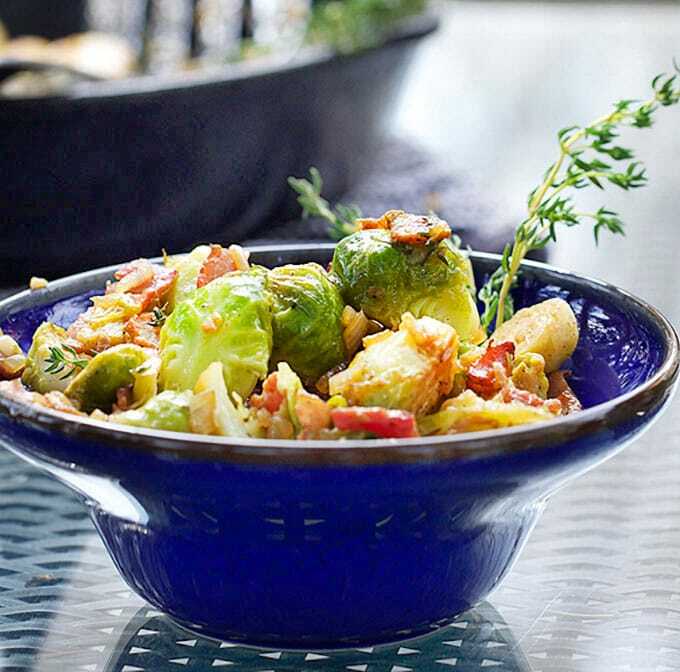 This brussels sprout recipe is from Kelly English, chef-owner of Restaurant Iris – recently named “best restaurant” in Memphis, Tennessee by Memphis Magazine. Chef English offers these as a starter on the menu at Iris. so much that it’s even become the mascot for Panning The Globe. PS – in case your wondering, I’m not paid by Lodge – just a true fan. 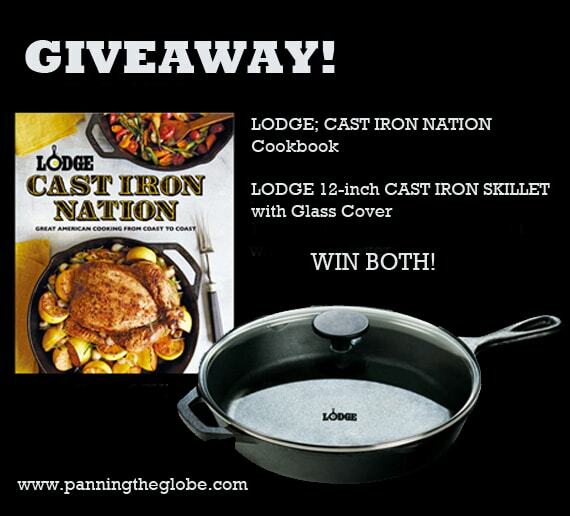 I’ve become friendly with the folks at Lodge Cast Iron, who have generously partnered with me on several occasions by providing great cookware for me to give away to my blog followers. 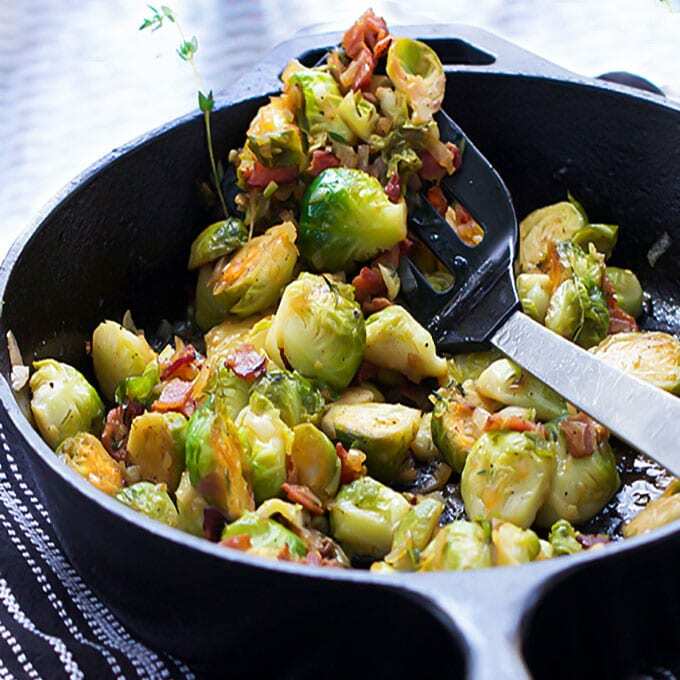 Here’s the recipe for Skillet Brussels Sprouts with Bacon and Sherry. If you try this recipe I hope you’ll come back to leave a rating and a comment and let me know what you think! Blanch the Brussels Bring a large pot of salty water to a boil. Fill a large bowl halfway with ice water and set it aside. Add the brussels sprouts to the pot. When it returns to a boil set the timer for 2 minutes. 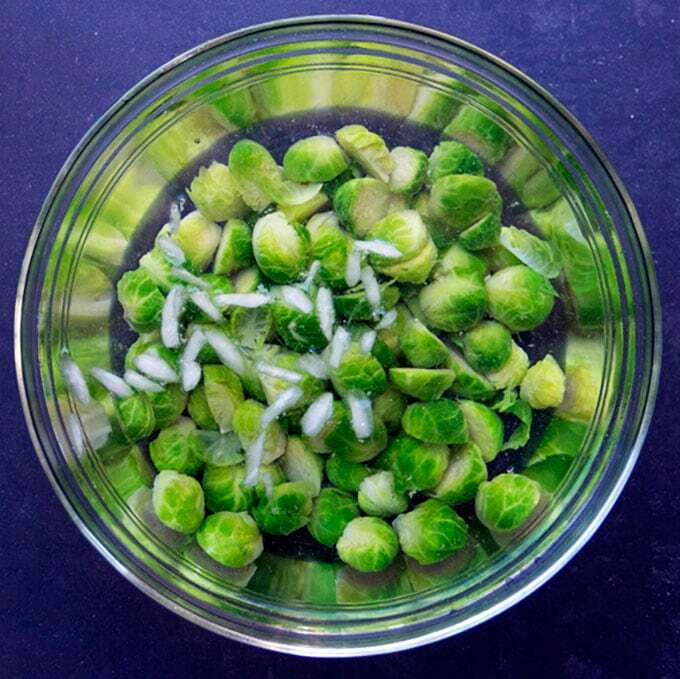 After 2 minutes, drain sprouts and shock them in ice water to stop them from cooking so they keep their crunch and their bright green color. Drain well and set aside. Make the vinaigrette Whisk oil and vinegar in a small bowl until it’s thick and emulsified. Set aside. Finish the dish Heat a large cast iron skillet (12-15″) over medium heat. Cook the bacon until it starts to crisp and the fat is released, about 3 minutes. Add the sprouts and turn the heat up to high. Using your spatula – turn as many sprouts as you can cut side down. Let them sear, undisturbed for 2 minutes. Add shallots, garlic and thyme to the skillet. Cook, stirring frequently for 3- 4 minutes longer, until the shallots are translucent. Remove skillet from heat and pour vinaigrette over. Toss to coat. Season with salt and pepper, to taste. Serve as a salad, starter, or side. This is perfectly timed. I like Brussels sprouts, but not the often soggy result when boiled or steamed. Plus we are big fans of Lodge cast iron skillets. My fiance would love this. He is a great cook, but unfamiliar with cast iron. This would help him learn. I love Lodge. I have a Lodge cast iron griddle that I only use for crepes. Nobody is allowed to touch it or make anything else in it. It’s the best. I can not wait to try this recipe, It looks so good! i have never cooked in a cast iron skillet and would love to. Thanks for the giveaway – would love to win! I would like to try this recipe. I think my kids would even like this. I have always wanted to own a cast iron skillet! 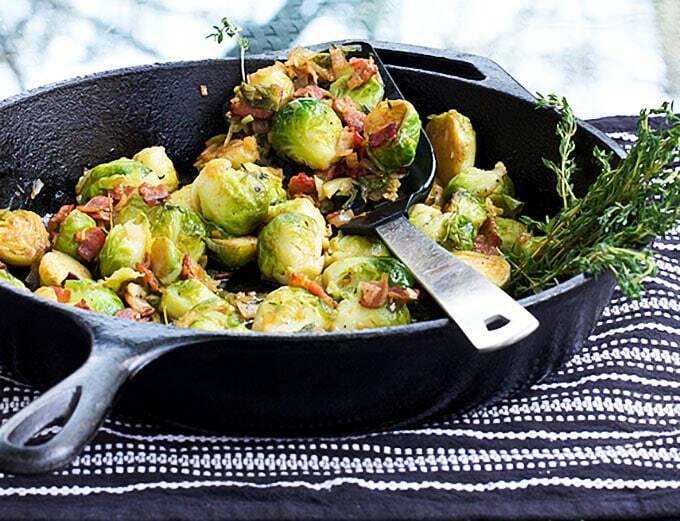 I would love to try the cast iron skillet, I heard that they are amazing to cook with. I have a cast iron skillet that I use to make cornbread. It always makes the best. I’ve always wanted a cast iron skillet. this is a beautiful recipe! i will make this for sunday night dinner! thank you! Love my Lodge skillet, but I’ve never had one with a lid before, love that! I just discovered your blog, I look forward to exploring! I would LOVE to get a Lodge Skillet!! 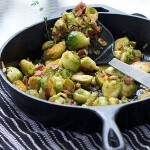 I loveeeeeee brussels sprouts with bacon! My hubby and I just made a brussels sprout and bacon pizza and it was pretty good! Not so much left over though. Thanks for the giveaway – I would love to read the book!